Beautiful early old train stock certificate from the Saratoga and Washington Rail-Road Company issued in 1853. This historic document has an ornate border with a vignette of an early train. This item has the signature of the Company's register, Robert Schuyler. This is the first time we have seen this company's certificate with a vignette. Around 1853, Robert Schuyler, president and transfer agent of the New York and New Haven Railroad, issued some $2 million in unauthorized stock. The legal limit of the Company's stock was 30,000 shares, or $3,000,000, there were afloat certificates of 50,000 shares, or $5,000,000, and consequently an over-issue of $2,000,000. This created great alarm throughout the country, and Mr. Schuyler fled to Canada. This was America�s first large-scale stock fraud, and its discovery created chaos throughout the United States. Schuyler had been president of five railroads, helped develop several more, and was known as �America�s first railroad king.� Moreover, his family was exceedingly well connected at the very highest levels of New York society. The fraud had important repercussions: for the company, years of legal battles and a loss of $1.8 million; for Wall Street, legal and procedural changes to prevent reoccurrence of this type of fraud; and for New York�s upper crust, a sense of shame and disapproval so strong it caused the very name of Robert Schuyler to be all but written out of the historical record. The Schuyler Fraud Cases Again. ; SUPREME COURT GENERAL TERM. Before Justices Sutherland, Leonard and Ingraham. The New-York and New-Haven Railroad Company vs. Robert Schuyler, Wm. Cross and Henry Chauncey and wife, impl. 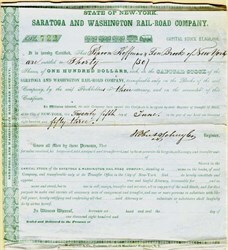 -- This action was brought by the plaintiffs, as will be remembered, against Robert Schuyler and over three hundred other persons, to obtain the judgment of this Court canceling a large number of spurious certificates and alleged transfers of stock made by schuyler for the use of himself and his firm, R. & G.L. Schuyler. SARATOGA AND WASHINGTON RAILROAD. - Chartered May 2, 1834. Capital $600,000. Company organized April 20, 1835, and work begun, but stopped in 1836. Finally opened to Whitehall, from Saratoga Springs, Dec. 10, 1848, and to Lake station, April 9, 1851. Sold Feb. 27, 1855, on foreclosure of a mortgage, and the Saratoga and Whitehall railroad took its place. SARATOGA AND WHITEHALL RAILROAD. - Organized June 8, 1855, as successor of the Saratoga and Washington railroad. Capital $500,000. Leased and run the Rutland and Whitehall railroad to Castleton, Vt., many years. Leased in perpetuity, and transferred under chap. 254, laws of 1867, to the Rensselaer and Saratoga railroad company, and the articles filed Oct. 22, 1868. Now operated under the Delaware and Hudson canal company.